14787 ft (4507 m) Highest point in Rwanda . The Virunga Mountains are the finest chain of volcanoes in Africa, a compact group of eight major volcanoes along with numerous minor ones straddling the three-way border junction of Congo, Uganda, and Rwanda. 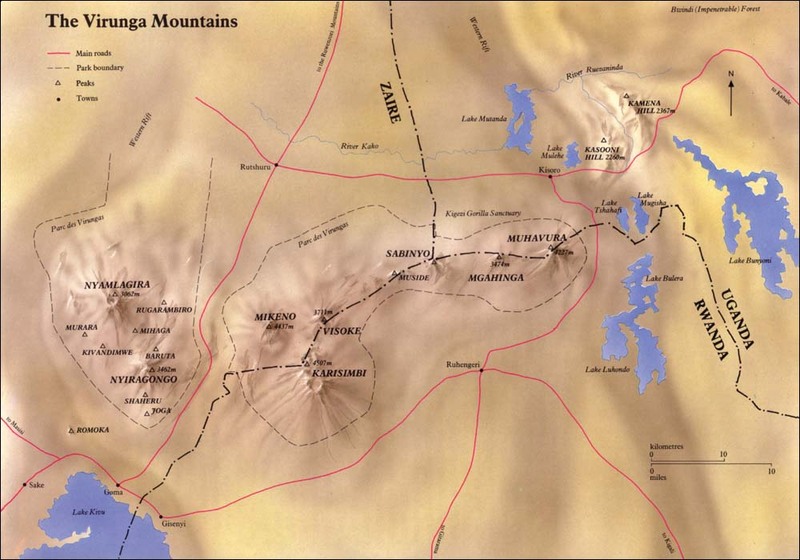 The range is most famous as the home of the mountain gorilla, and it is protected in three national parks, Parc National des Virunga (in Congo), Parc National des Volcans (in Rwanda), and Mgahinga Gorilla National Park (in Uganda). 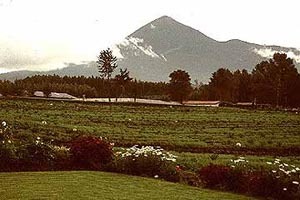 Karisimbi is the highest of the volcanoes at nearly 15000 ft (4500 m), followed closely by Mikeno and Muhavura each at over 13000 ft (4000 m). Karisimbi is a complex stratovolcano near the middle of the range which still retains a symmetrical form despite over 10000 years of inactivity, while Mikeno is a very old, eroded and extinct spire of bare rock just to north. Muhavura is a youthful, symmetrical cone which anchors the eastern end of the Virunga range. Snow occasionally falls on the high peaks of the Virunga, even sometimes as low as 11000 ft (3400 m), although it rarely accumulates to any depth. In fact, the name Karisimbi means "the white shell" in the local Kinyuruanda language, a reference to its occasionally snow-capped appearance. Under the best of circumstances, it may be possible to ski at least a short run on Karisimbi (or perhaps even Mikeno or Muhavura), although this remains only conjecture for now.